The winner of the Eagle Creek Adventure Carryon is Tracy Pryor. Thanks to all for entering! Stay tuned for upcoming giveaways. Read my review of the Eagle Creek Adventure four-wheel carry-on and enter for a chance to win one. Every frequent traveler is always searching not only for the next great adventure but also for the perfect carry-on. It’s the one piece of luggage used most often so it’s nice when you get it right. It weighs in at 7 pounds, 13 ounces. Because you often have to lift a carry-on (e.g., to place it in the overhead bin or sometimes to carry it off the plane as you precariously descend airline stairs), you want to start out with as lightweight a carry-on as possible—especially, knowing that you’ll be filling it with possessions that will add weight, such as your laptop. The carry-on has four multidirectional wheels—my idea of luggage nirvana. After you’ve had a suitcase with four multidirectional wheels, you’ll never go back! They take the strain off your back when you’re rushing from one terminal to another, enabling you to “walk it” or glide it beside you. These wheels are rugged and look like they will stand up to the wear and tear that comes from being dragged through city streets and parking lots. Only time will tell but a lifetime guarantee helps you feel more secure about the future. The recessed telescoping handle seems sturdy. Additionally, there are soft padded handles on the top, side and even the bottom of the carry-on so if you need to move it around there is always something to grab. This carry-on has two-way “finger-friendly” zipper locks with soft pulls at the ends so it’s easy to zip and unzip. A set of exterior straps with plastic clasps helps make the closure even more secure. This carry-on seems to meet the size requirements of most domestic carriers and some international ones. It’s sized at 14x22x9 inches but can be expanded to offer two more inches. The increased 11” depth when expanded creates 15% more room in the main compartment, which might be problematic on some airlines. Nonetheless, it’s nice to have the extra space available after you get off the plane in case you want to transfer personal belongings into the suitcase. The interior is nice and roomy with an inside pocket. If you are packing clothes in the bag, two clip-together padded compression wings will help minimize wrinkling of the items beneath them. The zippered outside compartment was large enough to easily pack by 13” MacBook Air. This makes it easier, if you need to take your laptop out for TSA security. Nothing (certainly not luggage) lasts forever but this one comes with the assurance of the Eagle Creek “No Matter What”™ Warranty. Through the end of August 2014, anyone who leaves a comment below telling where they would like to travel with their new Eagle Creek Adventure 4-wheel 22” carry-on will be eligible to be selected in a random drawing sponsored by MoreTimeToTravel.com in partnership with Eagle Creek. Retail Value $295, available in black, cobalt blue and olive. Disclosure: We were provided with a review sample of this product but any opinions expressed in this post are our own. River Walk in San Antonio, here I come! ALOHA! I want to take it to the Big Island of Hawaii! I would like to go to Cancun! I’m taking it to Manila! I dream of wheeling the Eagle Creek Adventure to Monterosso al Mare, Italy. I want to go back to Istanbul, had amazing 11 day tour of Turkey with Kimbell Museum, but now just want to REALLY explore Istanbul on my own, using this little piece of luggage!! I’d take it to Greece. If it could withstand those old roads, rocks and ruts we’ve traveled. . .I would come back and buy another to go with it! Nice review, Irene. I will be taking it with me back and forth between NYC and LA. Plan to be making a lot more visits to my old home, since my friends are getting upset with me for not checking in on them as much as I used to! Also will be visiting my son in NorCal more often since it’s his final year of college! Terrific piece of luggage! We would like to travel to florida with it to board a cruise! I would like to take the Eagle Creek Adventure 4-wheel 22” carry-on to St Lucia. Thanks for the giveaway… would take my Eagle Creek Adventure 4-wheel 22” carry-on to Dublin, Ireland ! I would take this wonderful wheeled bag everywhere as a liberating change from my old trusty backpack! I would love to take this to England to visit family! I want to take it to Costa Rica! I want to go to Florida with this suitcase! I want to use this carry on on my trip to Nashville TN this coming fall! I would like to take this bag with me to Jamaica. I would love to take this bag to Mexico this winter! I would take it to Sanibel Florida. I would like to travel to California. I would like to travel to Dubai with the Eagle Creek Adventure 4-wheel 22” carry-on. This looks like a very capable bag. I would take it on an autumn trip to New Orleans. Thank you! I would like to travel to Italy to visit my grandfather’s village. I would loooove to go to Disney World with my Eagle Creek bag. Thank you! I would love to travel to New Zealand. It has been my mom’s dream to go there ever since she was little. I will be taking it to Florida this fall for a wedding and then Los Cabos in February….and maybe on a river cruise through Germany with my 83 year old mother next fall…. 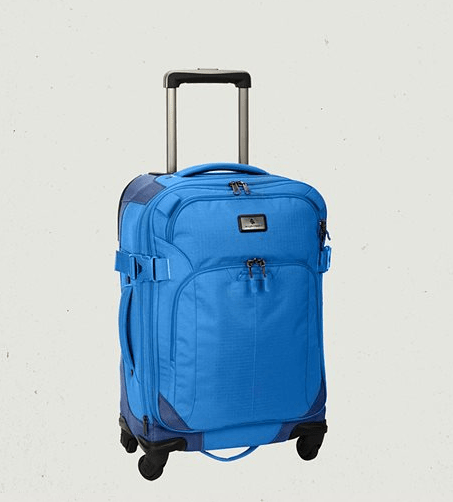 I would like to travel to Cancun with the new Eagle Creek Adventure 4-wheel 22” carry-on. I want to take it to Maine! I would take this high style, functional little beauty to Paris. I would love to go to Dubai. This looks like the perfect carry-on for taking books to book signings! I haven’t vacationed, even for a weekend in over 6 years. There are so many places I would love to go but I terribly miss being back home in Michigan. A road trip back to visit my favorite towns. Traverse City, Lake Leelanau, Suttons Bay and Leland are just a few. The wineries and coastal towns in late summer are beautiful. Thanks for a chance. I would take it on EVERY trip – especially on my next trip to the Eastern Mediterranean this fall! I’d love to take it to my fave Bay spots, San Francisco and San Diego! I’d definitely use it in my travels to Boston, NYC, and Orlando this year. In a dream world, I’d use it to travel to Italy because I’ve always wanted to go! I would go to Vegas! I would take it to my next European tour. I would like to travel to Disneyland. I would like to travel to Pennsylvania. practical North Carolina for grandkids Dream? Rome London Hawaii Scotland! I would love to go to California! Thanks for the giveaway! Everywhere and anywhere. It looks awesome! Australia – big suitcase for a big country! I would travel to visit my family in the Los Angeles area, then go to Disneyland! Bora Bora sounds good about now! I want to go to Yosemite. I’d love to take the Eagle Creek Adventure to Comino Island in Malta. New Orleans is my fun-time getaway. Love to take this quality bag along with me! I want to bring it to St. Croix, USVI! I’ve been there twice and still never get enough of it! i’d bring it to Rome! I’m going on a vacation to Disney World in December and I’d love to take it there! Going to TX and this will be perfect! I think this bag would be perfect for my New England Cruise in October! This would be great for visiting my Mom in Virginia and my daughter & granddaughter in North Carolina! I’m taking a trip to see my grandkids in Chesapeake, Va., and this would be perfect for that trip! I hope I win! I’d love to go to New York City! I want to take it on my trip to New Zealand next year. I would take it to New York. Would love to go to San Juan! I would like to go to Chicago. I would love to one day take it to Italy, but first it would be used to visit family in NY. I’d like to take it on our New Years vacation planned for Orlando, Florida. I would take it with me on my trip to Washington DC in October. I would love to have this accessory travel bag. I choose the bag in cobalt. It would make the perfect travel companion for my trip to Oregon! Los Angeles to visit my daughter. Anchorage Alaska to see my brother. To travel with my wife for our anniversary! I would like to travel to California to see the BIG trees. Definitely back to visit Puerto Rico! I want to travel to Venice, Italy. I would go to New York City. To Italy and strive to PACK LIGHT! This color is beautiful! Would take with me to Panama City Beach! I would love to go to New England in the fall. I want to go to key west. I would like to travel to Hawaii. Would love to go to New Orleans for Mardi Gras this upcoming year! I would like to travel to Austin Texas to see Austin City Limits, and take a bike ride there. I would like to go to Yellowstone – it would be absolutely beautiful! I would love to travel to California. I’d like to travel to the UK. All the way to Disney World!! Disney World here I come! I would love to go to the Outer Banks of North Carolina! I would love to travel to Hawaii for a month long vacation. I would love to win the bag and take it with me on a fall trip to Jackson Hole, WY. We’re heading to Orlando soon – would love to pack in this! I would take one to Santiago Chile. I would take it to Paris! I would like to visit London. I’d love to take it to Chicago. Thanks for the entry! I would like to travel to Biltmore in North Carolina with my new Eagle Creek Adventure 4-wheel 22” carry-on. I would take it on an adventure to Disney Land! I would take with me back to the mountains in Idaho. I would like to go to San Francisco with it. when I fly back east (to NJ) to visit my mom this holiday season! I would take it to Paris. I would love to travel to Ibiza Spain!! I would take it with me to visit the Tetons! I would ravel to see my Mom in Louisiana. Kauai would be my choice! Hawaii, fun in the sun and surfing the waves. Tokyo Japan so I can visit my friend that is there. I would travel to Denver, CO to visit friends. Thanks! Oh, to Munich! But before that, a proper road trip in late October from Rochester, NY to Houston, to Scottsdale, to Flagstaff, to Denver, to Vegas, to Duluth, and back to Rochester. I would take with me to Nashville. I trip I have planned. I’d take it to conventions this fall! I would take it to Aruba…if my husband hits quota! Fx! I would be taking it all over the US when I travel to see my favorite group the Lettermen. Austin Texas is where I would like to go. I would like to travel to Detroit. I would like to travel to Buenos Aires with the new Eagle Creek Adventure 4-wheel 22” carry-on. We would like to go to Buffalo, Wyoming for Longmire Days. I want to travel to England with my new Eagle Creek Adventure 4-wheel 22” carry-on . I would like to go to Glasgow with a lovely black Eagle Creek Adventure 4-wheel 22″ Carry-on. I would like to travel to visit family in North Carolina using my Eagle Creek adventure carry-on. I would love to bring this to my honeymoon in Hawaii!!! I would love to take this to Italy! Would love to go to Paris, France! I’d love to take this to Colorado! I’d take he luggage on a cruise to Greece. My daughter is going to London this Spring! I’d love for her to take this! I’d like to take the luggage to Hawaii! I would like to take a trip to Hawaii but I would probably use this guy for most of my traveling back and forth from home to college. I do a lot of flying. I would take a trip to Antigua. I’d like to explore Italy! I’d like to take it to New Zealand! WIll take it to California and Vegas. I would love to take this travel bag with me to Rome!!! I would like to travel to Ireland! I’d like to go to Disneyworld! I want to take this with me to Ireland! I’d like to travel to Philadelphia to spend some time with family. I would be traveling to Baltimore to see my son, his wife, and their sweet baby girl. Would love to take this to Vegas with me when I go in December. I would take the bag to Austin, Texas to visit my daughter. I would take it on my next trip to London! I would love to take an adventurous trip through New England in autumn. Thanks for the chance to win. I would take to Hawaii. I would take it to Lake Tahoe!!!! I would love to visit NYC or Paris with it! I would love to go to Elvis’ Graceland in Memphis, TN. I will take it Bosten next year as I fly to a convention. I would love to take this with me to go visit my sister at college! I’d take it with me to Orlando, Florida. I LOVE Disney World! I’d love to go to Australia. I would like to travel with it to San Antonio.